Many businesses and homes have been installing security cameras for years. Most of these systems have been analog (traditional CCTV) cameras that run with coaxial cables. As technology has progressed, resolution of security cameras has improved from the traditional 720x480 resolution to newer 1920x1080 resolution which means that you can get clearer pictures for better identification of faces and vehicles. Now, many business and homeowners are starting to look for ways to upgrade their former camera systems to make use of the newer technology. While most systems require starting over from scratch, Platinum CCTV has several options to help you upgrade your camera system features and functions or even resolution with minimal labor. One of the easiest ways to get more out of your camera system is to upgrade your older, cheaper DVR recorder with a newer AVM system, which delivers better recording sensitivity, remote access to video and especially playback capabilities. Our Analog AVM DVRs and DVR cards can be used in place of your older standalone DVR by just unplugging your old DVR and plugging in the new AVM system to your existing cameras. While this will not increase the resolution of the cameras, this option is best for enhanced functionality when your cameras already provide good enough picture quality for your needs. For business or homeowners who want to upgrade both functionality and resolution, our HD-SDI camera systems with AVM technology are an ideal choice. With these camera systems, you can use existing RG-59 coaxial cabling and simply unplug the old cameras and DVR, and upgrade to new HD resolution cameras and HDVR recorder without the expense and difficulty of running new cables. 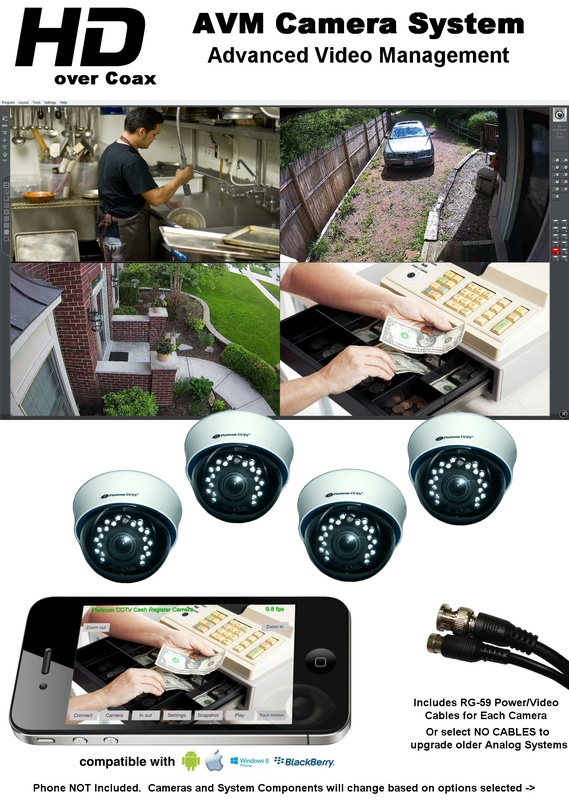 These camera systems make upgrading your total building security to HD easier.